We have a splendid lunch! The Tuesday Lunch Club is open to anyone! Meeting on every other Tuesday (for current dates see under Events) at 12 Noon until 1:30 PM, a hot meal is provided including a main course (meat and vegetables), pudding, and tea and coffee. The cost is £4.00 per person. The Lunch Club is a good chance to meet, chat and share time with your friends and neighbours. 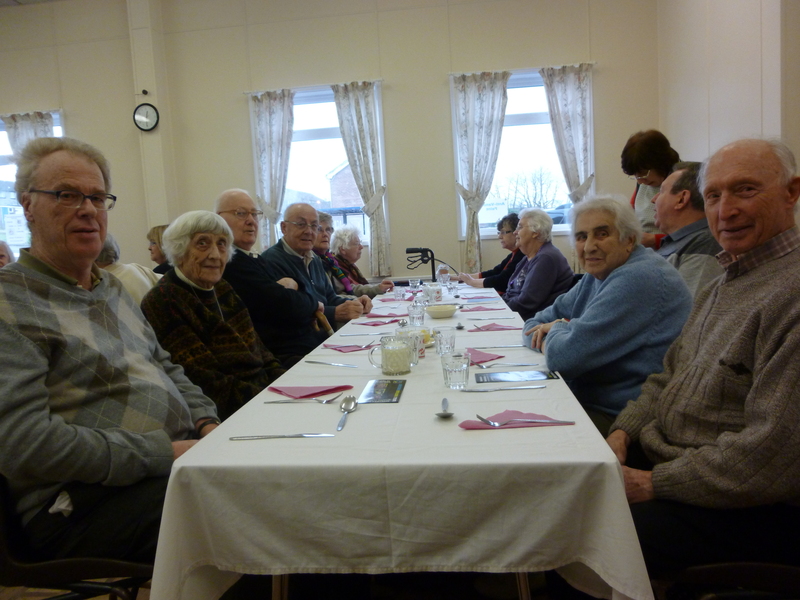 The Tuesday Lunch Club was founded in late 1986, and currently serves between 30 to 40 people at a sitting. For information, please contact Angela Webster (0114 288-4377) or the Revd. James H. Grayson (07780 70-1116). 1. Cottage Pie, carrots, cabbage, gravy, fruit crumble and custard. 2. Salmon and Brocolli Bake, carrots, peas, dill sauce, chocolate sponge and custard. 3. Meat and Potato Pie, mushy peas, carrots, gravy, trifle. 4. Savoury Beef Cobbler, mashed potatoes, swede, cabbage, gingerbread and custard. 5. Roast gammon, pineapple, roast potatoes, mashed potatoes, peas, carrots, Bread and Butter Pudding and custard.